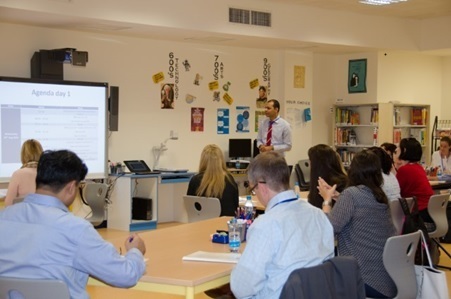 In this article a PYP educator of a continuum school in Qatar presents an induction plan for new teachers joining the team. The yearly turnover of teaching staff is one of the biggest challenges for international schools. New teachers joining the team usually come from different backgrounds, cultures and with or without the IB experience. At SEK Qatar we believe that our induction is essential in building the school community, to ensure the sustainability and the ongoing growth of the IB programmes in our school. Building the team is a key factor for a successful school. “TEAM: Together Everyone Achieves More” is our key message from day one at school. Team building in an international school is not an easy task as people come from different backgrounds. We have a diverse team of teachers from more than 10 different nationalities: New Zeeland, Spain, India, Pakistan, Greece, Lebanon, Jordan, Tunisia, UK, Ireland, USA, Canada, Nigeria, Philippines. During the first two days, the IB coordinators facilitate team building activities for the new teachers and on the first day the returning teachers are back, a group of them facilitates this task. We are one school that offers the PYP, MYP and DP, and we have one mission statement. These kinds of activities will not happen only at the beginning of the year, but it will take place once per term, where all the teachers and the admin team participate and have fun together. Team building activities create stronger relationships between the members of the team which creates a supportive atmosphere during collaborative planning meetings. The school also ensures that there are opportunities for social events outside the school for the whole team. The Arab world, Qatar as an Islamic country, the desert, teaching Islam for Muslim students, teaching Qatari studies for all students, the Hijab, the pig, the alcohol, Ramadan, the celebrations, the left-handed people, the magic… Expat teachers come with a lot of questions related to those ideas which are connected to many stereotypes and prejudices. From day one we try as much as we can to clarify those points in the session about cultural awareness. The school has a professional development policy that we share with all the teachers to ensure that all our new PYP teachers are trained in a category 1 workshop. Because we believe that we are lifelong learners we offer the teachers the possibility to also attend SEK Professional Development. During this time, teachers will have the chance to collaborate and work together as one team or as teachers of one grade level, depending on the meeting agenda. We use “OneNote” to make sure that all weekly/ daily plans are clear and accessible by all teachers. Teachers at our school do not only collaborate on curriculum work but also through their involvement in various social committees in our school. 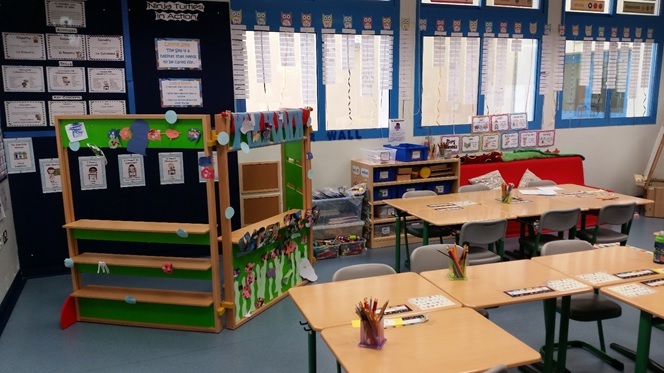 The classroom preparation: this is really one of the areas that takes time from teachers and puts a lot of stress on them if their classrooms are not ready. The school makes sure that teachers get all materials needed at the beginning of the year to be able to prepare the classroom environment. We recommend to the teachers to just prepare the framework of the class and wait for the input of the students to decorate the walls and boards. The use of the new technology is essential in the school. We have Smart Boards in all the classes; students bring their own laptop in MYP; there is a laptop trolley and iPad trolley in the PYP; two desktop computers in PYP classes; one computer Lab with Desktops and Mac; a 3D printer; cameras; microphone; many tools are fully integrated in the curriculum. We are a certified Lego school and to be able to meet the needs of our digital learners, we need to make sure that all our teachers are up-to-date. Our ICT curriculum coordinator organizes a mini PD session during the induction as well as provides ongoing training during the year. He participates in the planning meeting for each unit and makes sure to provide the teachers with the newest technology that helps in an inquiry-based classroom where learners take the lead and the initiative. Our school’s whole induction programme model ensures that teachers’ needs are met as they transition to a new country; they are familiar with the requirements and policies of the school; and they feel that they are part of a team. Ali Ezzeddine is a trilingual IB educator. Ali’s passion is to start new IB world schools. In the past, he was representing the IB AEM region for the PYP committee. He started writing and publishing Arabic books and spreading his love for reading and writing in schools around the world. Back to school? Don’t miss anything important! Totally dedicated to a superior education! Thanks, Ali! Dear Ali, I deeply agree that induction programmes for new teachers are an urgent task. It is every organization’s commitment to guide teachers on being aware of their new school and background of future students. By internalizing their needs and interests we will meet on the way to grow as learning communities and cooperate to construct knowledge. I congratulate the meaningful job you and your colleages do to train teachers and convey the IB philosophy, ensuring that it becomes in part of their lives, and showing coherence with their daily acts. Great article and a fantastic beginning of the academic year for all involved. Wishing our school could “tap into” the energies that you are sharing so freely. Regards and best wishes for the 2017 academic year. I loved hearing your ideas for induction at our jobalike. It’s a great idea to use the transdisciplinary themes as a base for teacher induction and also to have the team bonding time as a goal. I wish all schools had access to 2 weeks for induction! Its really good to read your article , its a boost for all the teachers who read this , Good job! Its so nice of you to share you thoughts with all. Wishing you all the very best for the forthcoming academic year. As a PYP teacher, I could feel the passion that burns within you. This kind of induction will truly guide new teachers, and refresh those who are returnees. I wish that PYP coordinators would read your article, to give them ideas on how to start a school year. I particularly find the open-ended questions based and PYP transdisciplinary theme inspired induction very creative and helpful. Thank you,Ali for sharing your induction process. Using Transdisciplinary Themes for induction is a great idea. All the best for the new academic year. Your school is building and promoting a real IB community. Your teachers are living the IB philosophy since the very beginning. I have more than 20 years in IB schools and I ‘ve never had an induction like yours. 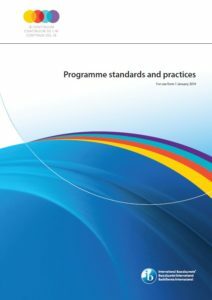 Thanks for the most comprehensive professional development programme offered, implemented and sustained! Feedback is valuable, continuous and fantastic! What an absolutely great way to induce new teachers. I love your ideas. Thank you for sharing! Leave a Reply to Giovanna Click here to cancel reply.